Often one can catch a glimpse of Collins equipment on TV or at the Movies. It’s always interesting to see how accurate the particular scene portrays the equipment. I thought it might be interesting to publish a list of “Collins Spots” based on notes I’ve made over the years. By publishing this list, I hope you might add your “Collins Cameos” by dropping me an email. 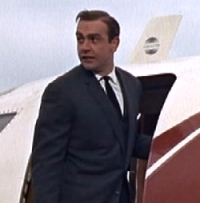 United Artists Sean Connery, Honor Blackman James Bond exits a Jet Star aircraft sporting a Collins VHF Blade antenna with the “meatball” logo on it. VHF aircraft Blade antenna. Universal Pictures Cary Grant, Trevor Howard Several Collins radios are shown in the radio room of the British Base. ? ?